Supermassive black holes (SMBHs) can get to be pretty large. Astrophysicists don’t really know what the upper limit is, if any. But before some recent research, the mass of the largest SMBH yet determined was 6.3×109 M⊙ (solar masses). That value is known fairly precisely, since the SMBH is in the nearby giant elliptical galaxy M87, which is a mere 53 million light-years away. The latest research has identified two substantially larger SMBHs, but the masses are known less precisely, since the objects are a lot farther away. One SMBH is in NGC 3842 and has estimated mass of 9.7×109 M⊙, at a distance of 320 million light-years. The other is in NGC 4889. Its mass is known considerably less precisely but may be more than twice that of the SMBH in NGC 3842. (2.1×1010 M⊙ is the midpoint of the possible range.) It’s 336 million light years away. Both of these galaxies are also giant ellipticals. The uncertainty in the SMBH mass is much larger for NGC 4889 than for NGC 3842 because the mass estimates are based on the velocities of stars very close to the SMBH, and the uncertainties of velocity measurements in the former case were more than in the latter. The establishment of new records for directly measured SMBH masses is actually not the most interesting aspect of the new research. (Although the amount of media attention to the results might lead one to think it was.) One thing that’s more interesting is that a fairly straightforward method of estimating SMBH mass can be used out to a distance of several hundred million light-years with present technology. Detailed new research shows that there is a distinct correlation between galaxies with large, oxygen-rich gas halos and active ongoing star formation. Although active star formation requires large amounts of available gas, what is surprising is that much, or perhaps even most, of the gas may be in the halo region outside of where most stars are found. Galaxies without substantial halos evidently do not have sufficient gas in the inner regions alone, where most stars exist, to sustain star formation. Using the Hubble Space Telescope, a survey of 42 galaxies collected information about the distribution of gas in galactic halos that extend far beyond galaxies’ visible stars. Although the gas itself is not visible, its characteristics can be inferred from traces imprinted on the spectra of light from distant quasars. Two other large ground-based telescopes collected information for the same galaxies on their distances, masses due to visible stars, and rates of star formation. When the two sets of data were compared, some surprises emerged. In galaxies where stars are actively forming, the halos are full of large quantities of oxygen-enriched gas, which may have at least as much mass as is present in the visible stars. However, galaxies not actively forming stars did not have such massive halos. Among the key findings of the work is that the color and shape of a galaxy is largely controlled by gas flowing through an extended halo around it. All modern simulations of galaxy formation find that they cannot explain the observed properties of galaxies without modeling the complex accretion and “feedback” processes by which galaxies acquire gas and then later expel it after processing by stars. The three studies investigated different aspects of the gas recycling phenomenon. “Our results confirm a theoretical suspicion that galaxies expel and can recycle their gas, but they also present a fresh challenge to theoretical models to understand these gas flows and integrate them with the overall picture of galaxy formation,” said Jason Tumlinson of the Space Telescope Science Institute in Baltimore, Maryland; a coauthor of one of the Science papers. The implication is that there must be an efficient process of exchange between gas in a galaxy’s halo, the “circumgalactic medium” (CGM), and the inner region of the galaxy where most stars form and reside: the “interstellar medium” (ISM). Since stars need cold, relatively dense gas in order to form, they cannot form in the warmer, more diffuse CGM, so the gas from there must migrate inward, cool down, and become more dense. It’s now well-known that there’s a rough correlation between a galaxy’s size and the size of its central supermassive black hole (SMBH). The correlation is even better (for spiral galaxies) between the black hole size and the size of the central bulge of the galaxy. It’s been found that the mass of a SMBH is generally close to 1/1000th of the mass of the central bulge. So in some way or other, it seems that galaxies and their black holes grow together, although it’s still unclear whether the galaxy or the black hole takes the lead. The question can be asked in a different way. Which factors contribute to galaxy growth and which to black hole growth? The problem is that black holes usually can’t be observed, or even detected, directly. About the only way to find SMBHs is when they are part of an “active galaxy”, in the form of an active galactic nucleus (AGN). AGNs represent a stage in which large amounts of gas and dust are being swept into the vicinity of a black hole, before actually falling into the black hole. This is a fairly unusual state, which occupies perhaps only about 1% of a galaxy’s life time, if it occurs at all. Nevertheless, AGN are commonly used as indicators of a growing SMBH. It’s certainly true that SMBHs grow while its galaxy is “active”. One obvious mechanism for the simultaneous growth of galaxies and their SMBHs is merger between two (or more) galaxies. This has been the favored theory for some time, and a number of studies provide some evidence for its occurrence. Recent examples: here, here, here, here, here, here. However, more recently, other studies suggest that mergers may not be the most common cause of AGNs: here, here. Cleary, this is still an issue that’s as yet very much unresolved. 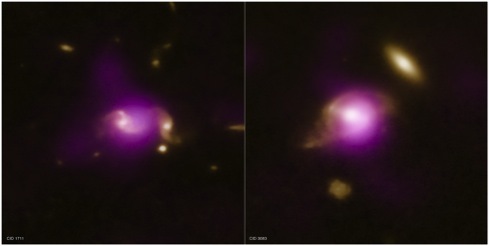 The latest research to appear adds more evidence that galaxy mergers – and probably even close encounters – do contribute to the growth of SMBHs and stimulate flare-ups of AGNs. Galaxies have been growing over most of the 13.7 billion year history of the universe. Some of the growth is due to intergalactic gas gradually swept up by an existing galaxy and then driving star formation in the galaxy. But another growth mechanism is the merger of two (and sometimes more) existing galaxies into one. In this case, star formation in the merged galaxies increases as the gas within the galaxies is stirred up during the merger. Bursts of star formation are important, since in most cases our only indication of the size of a galaxy is its brightness resulting from visible stars. In general, there’s no good way to determine the mass of a galaxy that is due to dark matter and the presence of gas outside stars. Astrophysicists generally assume that large, symmetrical spiral galaxies (such as our Milky Way) have not merged with other galaxies of similar size, though they may have incorporated several smaller galaxies. However, a large elliptical galaxy is expected to result from the merger of a large spiral and another galaxy of similar size. For a large elliptical galaxy, it’s natural to wonder about the relative importance of the two possible growth mechanisms in the galaxy’s history – growth by merger and growth by accretion of intergalactic gas. That in turn naturally raises the question of how often mergers occur between galaxies of varying relative sizes. New research that is soon to be published gives much better estimates of merger rates. A new analysis of Hubble surveys, combined with simulations of galaxy interactions, reveals that the merger rate of galaxies over the last 8 billion to 9 billion years falls between the previous estimates. The galaxy merger rate is one of the fundamental measures of galaxy evolution, yielding clues to how galaxies bulked up over time through encounters with other galaxies. And yet, a huge discrepancy exists over how often galaxies coalesced in the past. Measurements of galaxies in deep-field surveys made by NASA’s Hubble Space Telescope generated a broad range of results: anywhere from 5 percent to 25 percent of the galaxies were merging. The study, led by Jennifer Lotz of the Space Telescope Science Institute in Baltimore, Md., analyzed galaxy interactions at different distances, allowing the astronomers to compare mergers over time. Lotz’s team found that galaxies gained quite a bit of mass through collisions with other galaxies. Large galaxies merged with each other on average once over the past 9 billion years. Small galaxies were coalescing with large galaxies more frequently. In one of the first measurements of smashups between dwarf and massive galaxies in the distant universe, Lotz’s team found these mergers happened three times more often than encounters between two hefty galaxies. It has not been easy to get good estimates of these merger rates. The problem is that all we can observe, for any given possible merger, is a snapshot of the action. Active galactic nuclei (AGN) – produced by matter swept violently into the vortex around a supermassive black hole that may have billions of times as much mass as our Sun – can put on some of the most spectacular fireworks in the universe, over periods as long as 100 million years. Astrophysicists have sometimes speculated that AGN may be so energetically active that they diminish or even extinguish formation of new stars in the host galaxy. Recently published research, making use of the PRIMUS faint galaxy spectroscopic redshift survey, suggests that the speculations are wrong, and that AGN can be found even in galaxies in which very active star formation is occurring. The research gives some answers to the larger question of what special characteristics, if any, the host galaxies of AGN may have. Because astronomers had seen these objects primarily in the oldest, most massive galaxies that glow with the red light of aging stars, many thought active galactic nuclei might help to bring an end to the formation of new stars, though the evidence was always circumstantial. That idea has now been overturned by a new survey of the sky that found active galactic nuclei in all kinds and sizes of galaxies, including young, blue, star-making factories. “The misconception was simply due to observational biases in the data,” said Alison Coil, assistant professor of physics at the University of California, San Diego and an author of the new report, which will be published in The Astrophysical Journal. “Before this study, people found active galactic nuclei predominantly at the centers of the most massive galaxies, which are also the oldest and are making no new stars,” said James Aird, a postdoc at the University of California, San Diego’s Center for Astrophysics and Space Sciences, who led the study.